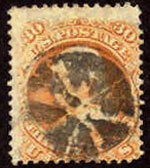 US SC#71, 30c. used CV $70 No min., no reserve. 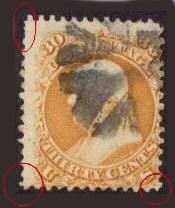 The red circles detail key perforations used to identify the bogus 81 on the right. 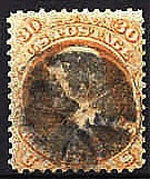 The stamp to the left was altered and resold as the very rare Scott #81 on the right. OR INTENDED THAT IT IS INDEED GENUINE. WE DON'T EVEN DARE IMAGINE THIS IS GENUINE AND NEITHER SHOULD YOU! The 1861 thirty cent Franklin, nice "socked on the nose" cancel. 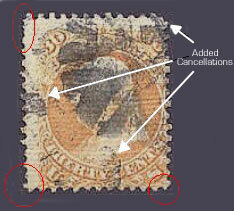 The stamp on the left was reperfed and new cancel added. It has found a new life on the right. Also note that the stamp was reperfed at the top and the left side. THERE IS AN ALL OVER GRILL OF LINEAR ROWS WITH GRILL POINTS IN STRAIGHT LINES. THE GRILL IS INTERRUPTED AT SPOTS AND LOOKS VERY REALISTIC. THE GRILL DOES NOT BREAK THE PAPER AS SCOTT SAYS IT OFTEN DOES.WE DO NOT EVEN DARE IMAGINE THIS IS GENUINE AND NEITHER SHOULD YOU. THIS IS SOLD AS IS WITHOUT IMPLICATION MADE OR INTENDED THAT IT IS INDEED GENUINE!! !